Add tortellini; return to a boil. Cook for 5-8 minutes or until almost tender, stirring occasionally. Reduce heat; add the spinach, basil, pepper and pepper flakes. 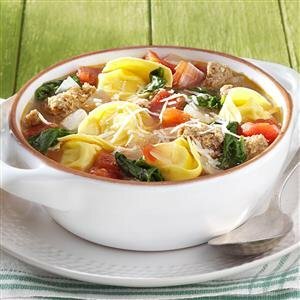 Cook 2-3 minutes longer or until spinach is wilted and tortellini are tender. Serve with cheese if desired. Makes 6 servings (2 quarts).